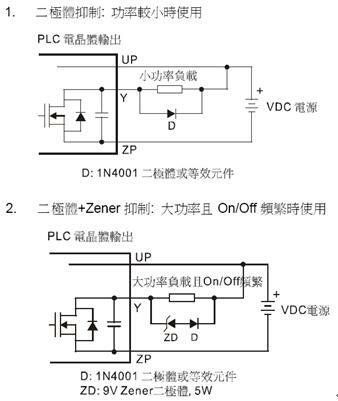 All transistor outputs of DVP-ES2/EX2 series PLC contain diode for back EMF protection, which is sufficient for small-power conductive load and average ON/OFF application frequency. 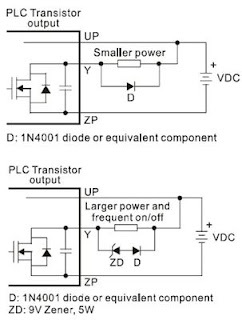 However, in big-power or high ON/OFF frequency environments, please connect to another suppression circuit (as shown in the figure below) to lower the noise and prevent damages on the transistor output circuit resulting from over-voltage or overheating. 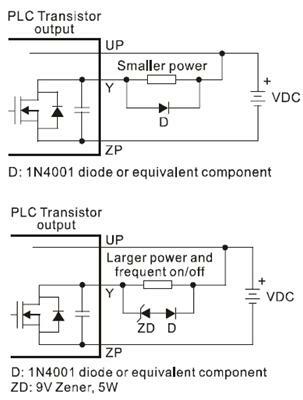 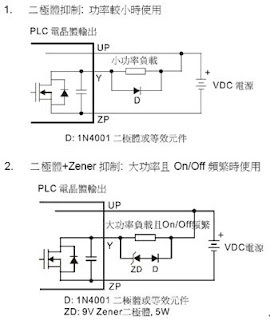 The transistor outputs are all open collector; therefore, if Y0/Y1 is set to be pulse output and to ensure the transistor module works normally, the pull-up resistor has to be maintained at output current > 0.1A.